LATEST CES REPORT–The City of Los Angeles saw 997 more Ellis Act Eviction application filed by landlords and developers for the first half of 2018, January through June. The Ellis Act, a state law passed in 1985, which undermines local rent control laws, provides landlords the ability to evict tenants in order to remove housing units from the rental market. The map can be accessed here. The map, using data provided by the Los Angeles Housing + Community Investment Department (HCIDLA), visually shows the devastating impact the Ellis Act has had on tenants being displaced and affordable rent-controlled housing lost. One can view the address of the buildings and the number of units lost there, due to the Ellis Act, by hovering over the dot using a computer mouse or laptop touch pad. The housing loss impact has been on neighborhoods across the city, thus worsening Los Angeles’ affordable housing shortage. 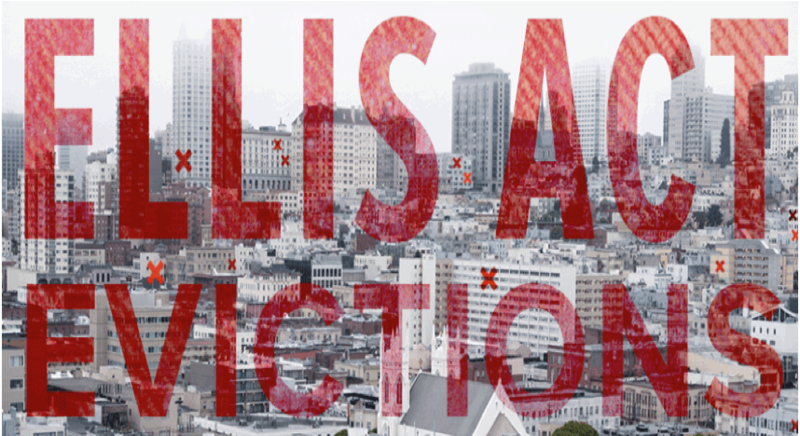 ” If Ellis Act evictions continue at this rate throughout the year, 2018 will see the most evictions of the decade in Los Angeles,” said Erin Mcel, co-director or the Anti-Eviction Mapping Project. Los Angeles is a city of renters with approximately 64% of its residents being tenants. Unfortunately, approximately 64% of those renters are paying unaffordable rents, with many paying 50% or more of their income to rent. Los Angeles has the highest poverty rate in the nation at 26%, meaning one in every four households is living in poverty. Los Angeles has a severe overcrowded housing situation with families needing to double up and triple up to afford the rent. Seven out of the 10 zips codes in the nation with the most overcrowded conditions are in LA. The Ellis Act only contributes to our existing housing crisis. We can no longer allow developers to go into communities and just bulldoze them to put up high-priced luxury housing. Because, if this continues, next time around there will be another initiative, which will deal with these issues directly, and it will gather more support. These actions would curb speculators buying rent-controlled property for the sole purpose of demolishing and destroying this affordable housing. Limit the # of rent controlled buildings allowed to be demolished per year. Require a one-for-one replacement of all rent controlled or affordable units that are demolished or converted at affordable rent levels. Provide incentives for developers to develop on vacant, commercial or city-owned parcels, while establishing obstacles for development projects that would result in demolishing or converting existing affordable housing. Up and down the state, activists and renters’ groups are collecting signatures to put rent control voter initiatives on the ballot. Rent control initiative drives are taking place in Sacramento, Santa Rosa, Santa Cruz, Santa Ana, Pasadena, Glendale, Inglewood, Long Beach and the San Diego suburb of National City. In addition, a statewide initiative, Proposition 10, which would repeal a longstanding state law, the Costa-Hawkins Housing Act limiting local rent regulations, is on the November 6, 2018 ballot.